Recently, I was watching a TedTalks, Johanna Blakley: Social media and the end of gender. Blakley claims that social media is going to help us dismantle stereotypes that we see in traditional media. 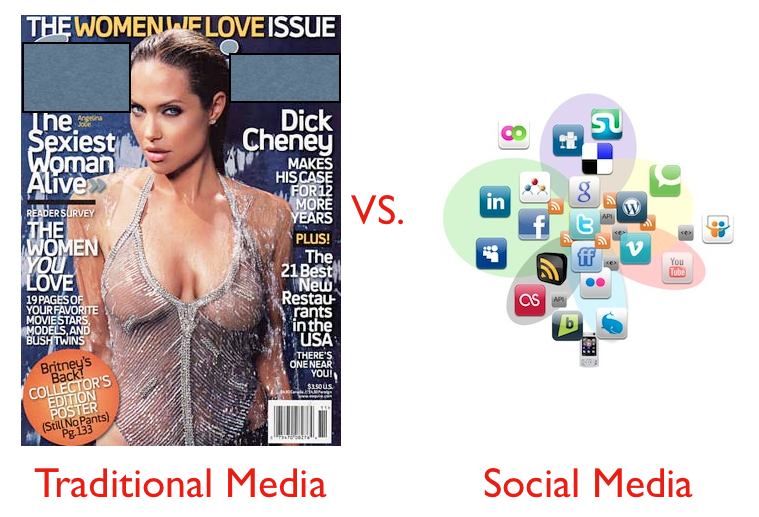 Traditional vs. Social Media - Social Media and the end of gender. a specific category, you are predictable in certain ways. You have certain tastes, and like certain things – popular culture is largely based on these presumptions. In traditional media, the older age demographic of 55-64 are not even taken into consideration, it is as if they do not exist! We are able to define ourselves online. Social media allows us to connect with people based on our specific interests. Companies realize that THIS is the mass audience of the future, but they are having a hard time acting on this knowledge, because they are using the traditional demographics. While companies are monitoring our movements online using social media, they are now identifying our interests, instead of guessing at them through demographics. What are they finding? Women are driving the social media revolution. In every age category, women out number men in their use of social networking technologies. Social media is having a huge impact on traditional media – could this mean that heading into the future, women are going to take over global media? Will our media landscape become a feminist landscape? Not necessarily. Instead, women will be hired on in advertising companies and put an end to stereotyped demographics (i.e., the Hispanic female between 18-24 likes big earrings, bright red lipstick, and fake nails, etc.). We will now know what people like to do, no guess work required. Through our social media analytics software, MavenSocial is able to do just that, identify brand influencers on a campaign. We are able to connect a person’s email account with their social media networks, therefore giving a 360° account of the person’s social media presence, identifying what they like through their choices (i.e., what campaign do they enter? One that offers coupons on free cooking lessons, sky-diving, or a free week at camp?). Guess work is now a thing of the past. Heading in the future, will brands continue to pander to traditional demographics, or will they acknowledge that social media is the source for brand ROI? With Facebook and Twitter’s membership comprised of 50% women, the female population continues to dominate social media. As a result, women will continue to be a valuable audience and target for marketers. As social media evolves it will be interesting to see how advertising and marketing adapts to these rapid changes. A new social media measurement tool is upon us, a Pinterest influence score – but how do you calculate your score? With Klout, we have been able to calculate social media influence across multiple channels. Klout Score, measures influence on your ability to drive action. Klout covers all social media influence, pulled from your activity on Facebook, Twitter, Google+, LinkedIn, Instagram, and more…but what about Pinterest? Our social media toolbox is becoming more full as social media campaigns demand an increased knowledge of Science than Art (but Art is still important). With the rising popularity of Pinterest the past few weeks, I have come across the latest way to calculate and measure your Pinterest Influence. There are two companies that are vying for a piece of the Pinterest calculator pie, Pinpuff and PinClout. Pinpuff, measures your Pinterest influence. Pinpuff calculates people’s ‘Pinfluence’ on Pinterest. It is a measure of your popularity, influence, and reach. It also decides monetary value of your pins and traffic your pins generate. Pinpuff has worked to help people better understand why they are investing their business’ time in Pinterest; this is especially important as its popularity grows. Many businesses are creating Pinterest boards because of its popularity, but are forgetting to assess whether or not Pinterest will work for their brand, product, or niche market. It would be a misallocation of resources if a financial services institution spent time pinning to their virtual pinboards (yawn…!). With Pinpuff, businesses will be able to determine: to Pin…or not to Pin. They have hopes of becoming more than just a scoring devise, something that Klout has never managed. PinClout would like to offer analytics and data on Pinterest trends; this could prove useful to monitor ROI on your Pinterest campaign or to help plan one. As social media influencers gain popularity, tracking and analyzing social media ROI on a campaign will become crucial to not only the success of a campaign, it will also become the industry standard for social media business. Businesses need to identify and track their campaigns ROI now, before they are left behind. 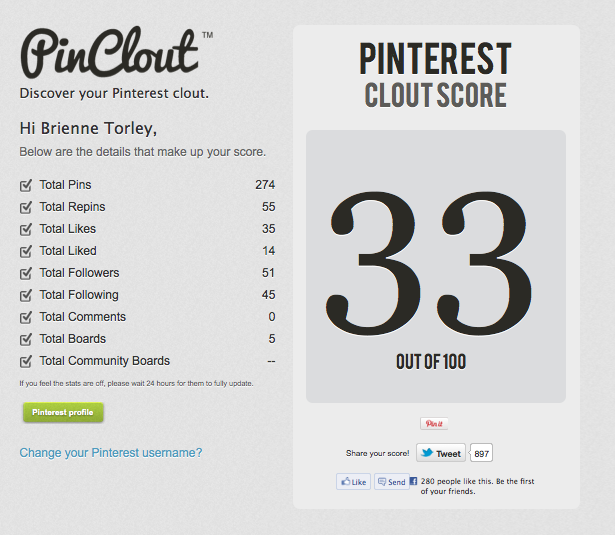 PinClout, measures your Pinterest influence. MavenSocial, works to track the ROI of a campaign through its dashboard analytics. 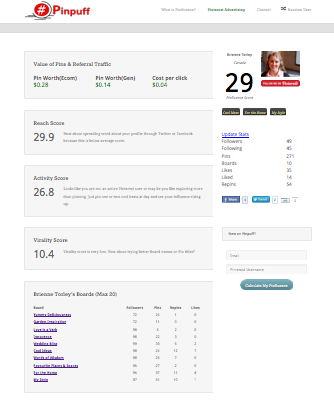 Track your social media influencers, determine the Social Lift (free traffic) to your campaign, and determine Social ROI all through WhiteFire software. Pinterest continues to gain popularity and longevity, signaled by Pinterest Influence trackers such as Pinpuff and PinClout. It will be interesting to see when and how these social media influence trackers evolve into an analytics and data tool for Pinterest. With its similarity to Klout, will Klout step in and lay claim to services such as these? Perhaps when Pinterest’s official API is released we will see some action. Until then, one fact still remains, the social media industry is moving towards tracking the ROI of social media campaigns.